Dinosaurs are freaking great. Is there anyone out there who couldn’t be charmed by these prehistoric behemoths, these gigantic beasts who were in their prime before time truly began? Plus, the raptors in Jurassic Park were scary bastards, weren’t they? Happy Dinos is more Denver The Last Dinosaur than “terrible lizard”. Actually, Barney the Dinosaur isn’t too far off, either. In a tropical paradise, you are charged with looking after the day-to-day care of some dinosaurs. It is down to you to feed, tame and then breed your stock of dinos. Why? No-one knows. There are three species of dinosaur (T-Rex, Brontosaurus and Triceratops), and there are tons of colour variations for each species. 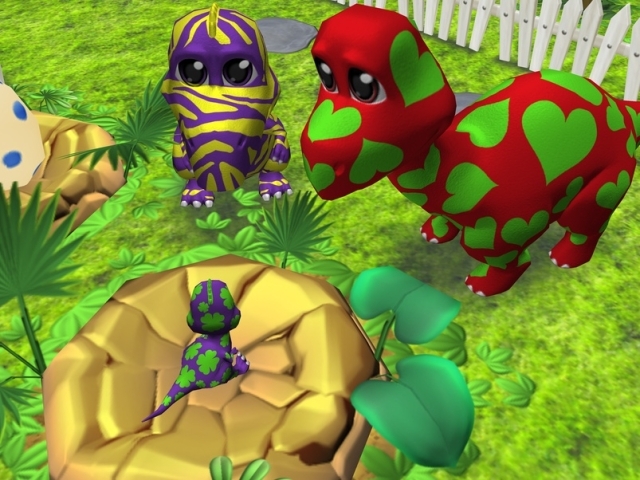 It appears that the aim of the game is to keep breeding various dinos, to create every colour possible (1000 possibilities from each species, making 3000 in total). All of this is done in usual freemium style, with a real-time wait required for dinosaurs to hatch and mature. So you oversee your prehistoric pets in a small section of their island paradise. Here, you are free to improve the surroundings, adding items and structures which increase the happiness of your beastiies. With enough money and gems (gained through the completion of in-game tasks and, of course, the dreaded in-app purchases), you will eventually be able to expand your operation across more of the island, allowing you to take care of more dinosaurs. 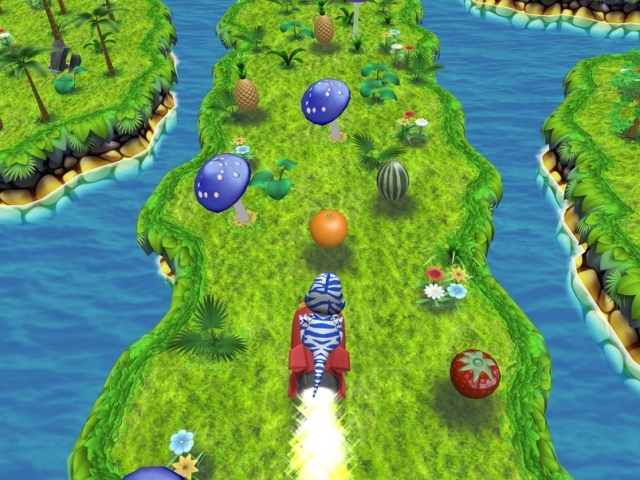 Some of your collection will need to be tamed; this is achieved by engaging in one of four very dull and simplistic minigames: Rocket Ride (collect fruit along a path while avoiding mushrooms), Twin Finder (pick out a dinosaur that’s identical from another dinosaur), Flying Dinos (tap on dinosaurs and avoid crates) and Dinosaur Hurdle (collect fruit and tap to jump over hurdles). These short, 30 second-long minigames are also used to teach your dinosaurs some pointless tricks that don’t seem to serve a purpose. 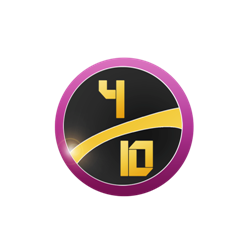 You’ll also be playing these repetitive minigames a lot, to earn XP to level up and unlock more purchasable items in the Market. You’ll also be given various tasks to earn more money, gems and XP and they all boil down to breeding or collecting a certain number or type of dinosaur; this is in addition to some Achievements, which all involve the same dino-wrangling tasks. That’s Happy Dino’s in a nutshell, really: the endless pursuit of using different coloured mates to hopefully get whatever coloured baby you’re looking for – and it’s mind-numbingly dull for it. It’s just the endless repetition of feeding, taming and mating, and after you’ve done it once, will you really want to do it another 2999 times, minimum? 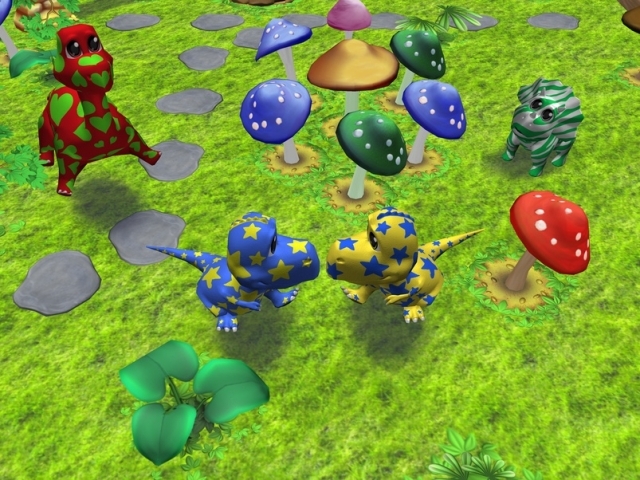 Rather annoyingly, you can only play Happy Dinos when you have a valid data connection – I honestly can’t think why. Then there are in-app purchases to make the process of training, breeding and raising dinosaurs a bit quicker, and Happy Dinos is really eager to get you to go down that route, with massive buttons on-screen telling you of sales on IAPs. Considering this game is obviously geared towards kids, this is something I find utterly irresponsible. Parents, make sure IAPs are blocked on your iDevice if you’re putting your kids in front of this. To make matters worse, the whole game is backed by one really irritating piece of tropical-themed music, looped over and over again. I want to imagine that’s how the dinosaurs really died out: a group of them starting playing irritating calypso music, and nature decided to punish the whole species for it. Then there are all the annoying bouncy sound effects that you’ve heard a million times over. Mobile developers, take note: your games don’t need to play an irritating “bounce” sound effect every time I jump. Stop it. Thankfully, at least the visuals are bright, colourful and full of character. If only the dinosaurs actually did more. VERDICT: This is just another freemium game among many other freemium games out there. Happy Dinos is just about endless repetition with no sense of reward or purpose other than to make you part with your money through IAPs. The fact that you can practically see everything the game has to offer in its tutorial should speak volumes about how dull this is.